(Nanowerk News) Scientists from the MESA+ Institute for Nanotechnology at the University of Twente in the Netherlands and Thales Research & Technology, France, have found a way to control heat propagation in photonic nano-sized devices, which will be used for high speed communications and quantum information technologies. Their results are published in the leading American journal Applied Physics Letters ("Local thermal resonance control of GaInP photonic crystal membrane cavities using ambient gas cooling"). Once the laser beam hits the surface of a sample it starts to generate heat which diffuses along the membrane but also it diffuses to the ambient gas. 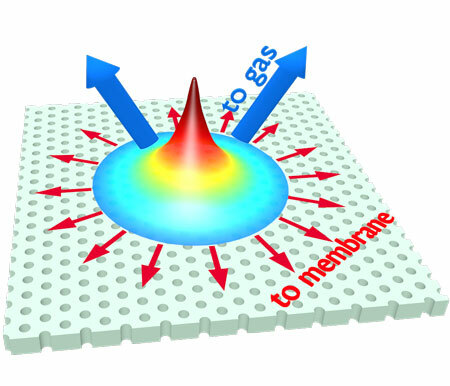 That effect reduces the width of the temperature distribution in the photonic crystal membrane.